When I opened up my Google Drive this morning to create a form I was pleasantly surprised to find that Google Form Add-Ons have arrived! I scanned the list of available options and found one titled Forms Notifications. I opened this Add-On in hopes of finding an option for streamlining my morning work. I’m happy to say I found an Add-On to help me auto-send an email confirmation to people who submit information through a Google Form. The Form Notification Add-On provides users with the ability to quickly create a custom message that is automatically sent to people who complete a form. Once the Add-On is installed, click on Configure Notifications to access a box for creating the message. This morning I found the Forms Notifications Add-On to be helpful for managing ThingLink Educator Expert Applications. Here is how I used the Add-On with an existing form to send quick communication to applicants after they submit the form. 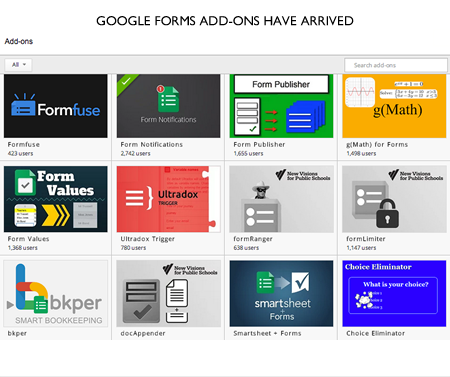 Here is a sneak peak at the other Google Form Add-Ons available now. I’m looking forward to trying some of them. Try them yourself by opening a Google Form and selecting Get Add-Ons. Remember to check back often and watch the 3rd party tools available grow!